A Martian rock slab called "Old Soaker" on Mount Sharp has a network of cracks that might have formed from a mud layer that dried more than 3 billion years ago. This image was taken by the Mast Camera (Mastcam) on NASA's Curiosity rover on Dec. 20, 2016. NASA's Curiosity rover has photographed shallow crevices on Mars that may have formed from ancient mud cracks, yet more evidence that the planet had a watery past. The photos, taken Dec. 20 and unveiled Tuesday (Jan. 17), show a site called "Old Soaker" on Mars' lower Mount Sharp. Scientists think the cracked layer likely formed more than 3 billion years ago, as a result of wetting and drying cycles, NASA officials said. "Mud cracks are the most likely scenario here," Nathan Stein, a graduate student at the California Institute of Technology who led the investigation of Old Soaker, said in the statement. "Even from a distance, we could see a pattern of four- and five-sided polygons that don't look like fractures we've seen previously with Curiosity. It looks like what you'd see beside the road [on Earth] where muddy ground has dried and cracked." Old Soaker's appearance suggests that over time, the cracked layer was buried by sediment, creating stratified rock, NASA officials said in the statement. Wind erosion later exposed this layer, and left behind raised ridges of sand and dust that filled in the cracks but is more resistant to erosion than the surrounding mudstone. Evidence of underground fractures from the pressure of overlaying sediment was found at Old Soaker, they added. Another view of "Old Soaker," a Martian rock slab on Mount Sharp whose cracks likely formed from drying mud. 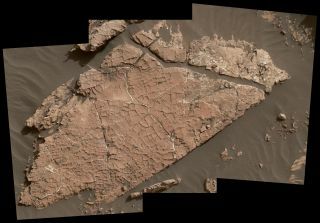 "If these are indeed mud cracks, they fit well with the context of what we're seeing in the section of Mount Sharp Curiosity has been climbing for many months," Ashwin Vasavada, Curiosity project scientist, said in the statement. "The ancient lakes varied in depth and extent over time, and sometimes disappeared. We're seeing more evidence of dry intervals between what had been mostly a record of long-lived lakes." In addition to the network of cracks observed on Old Soaker, scientists have found evidence of interspersed layers of sandstone and mudstone, as well as cross-bedding — a pattern of rock layers created when water passes over a loose bed of sediment. A view of another rock target on Mars, called "Squid Cove," and its immediate surroundings on lower Mount Sharp in Gale Crater. The small polygons near the image's right edge may be cracks from drying mud more than 3 billion years ago. The image is a mosaic of photos taken by the Curiosity Mars rover's Mastcam Dec. 20, 2016. "This pattern can form where water was flowing more vigorously near the shore of a lake, or from windblown sediment during a dry episode," NASA officials said in the statement. Further observations of Mount Sharp will help scientists determine how and when Mars became a dry planet.